I was asked to develop some recipes for South African stone fruits. 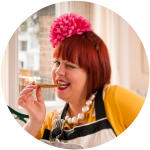 I had such great fun with them last year, doing a supper club for instance, using plums and pluots or plumcots (a combination of plum and apricot) in every course from the cocktail to the cheese board. I’m waiting for the ‘bubblegum’ plum season -February to March. Last year, I made exciting flavours of jam from these plums, the ‘Flavour King’ cultivar. Look out for South African stone fruit in your local supermarkets. Here is a very quick dessert, a tarte tatin, classically made with apples, but this time with nectarines. I’ve added almonds to this recipe, which are part of the same ‘prunus’ family as apricot kernels. You could also use peaches or plums. I always have puff pastry, either ready-rolled or in a block in my fridge or freezer; puff pastry and any fruit, eh voila, you have an acceptable dessert! 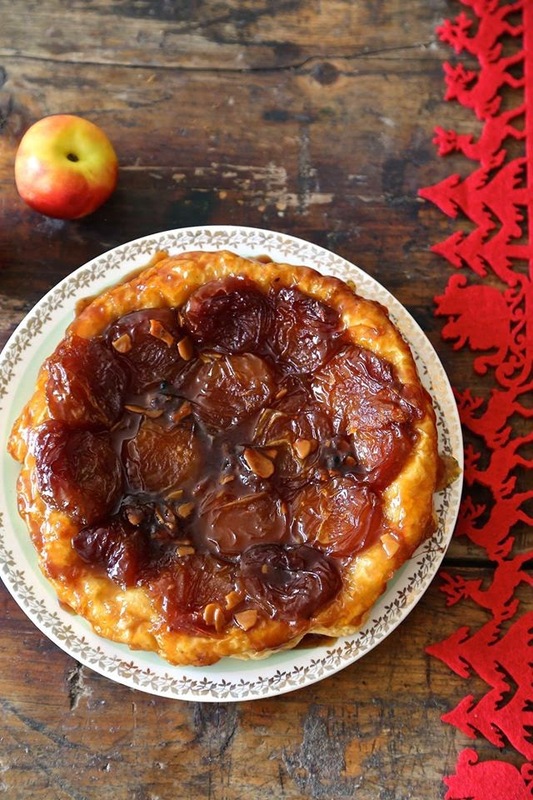 This upside down tart is commonly made with apples but other fruits also work well such as pears, plums nectarines or peaches. It’s very easy to make but have the courage to let the nectarines caramelise; let them cook slowly for enough time so that their juices blend with the butter and sugar. You will also need a bit of courage to flip over the pie. You will need a frying pan that has an oven proof handle. 1. Smear the butter generously on the bottom and sides of the frying pan. 2. Place the nectarine halves, cut side up into the pan; pack them in tightly, they will shrink as they cook. Then sprinkle over the sugar and add the vanilla pods. Place the frying pan over a medium heat, the butter, sugar and nectarines will take about 15 to 20 minutes to turn a lovely golden colour. At the end, sprinkle over a handful of slithered almonds. 3. Preheat the oven to 200c. 4. Cut the puff pastry into a circle that covers the circumference of the frying pan; this will be the lid (and eventually the bottom) of the tart tatin. 5. Remove the frying pan from the heat and flop the puff pastry circle over the frying pan and put it into the oven. Bake for 15 minutes or until the pastry is pale gold and risen. 6. Remove from the oven and prepare a flat plat larger than the frying pan. Then hold the plate over the frying pan and quickly flip it over so that the pastry is on the bottom. Remove the frying pan, nudging any displaced nectarines back into place. You will now see the beautiful sunset-hued tarte tatin. 7. Enjoy with a scoop of crème fraiche or double cream. For more South African fruit recipes go to Beautiful country, beautiful fruit. My first ever tarte tatin was with flat nectarines, I've still never done an apple one. Definitely want to try those bubble gum plums. Shall look out for them!